Prodrug is an important concept in drug design. A prodrug is administered in an inactive form, and is then converted to an active metabolite in vivo. Prodrugs are often designed to selectively release the parent drugs in the diseased tissues. Prodrug strategy is always used in the design of small molecule drugs. CytomX Therapeutics (NASDAQ: CTMX) applied the concept to create antibody prodrugs that remains inactive until it reaches the tumor. The antibody prodrugs are called probody for short. The probody concept was proposed by Prof. Patrick Daugherty who co-founded CytomX in February 2008. The design and preclinical data of anti-EGFR probody CTX-023 have been disclosed in the journal Science Translational Medicine. The probody consists of an authentic IgG heavy chain and a modified light chain. 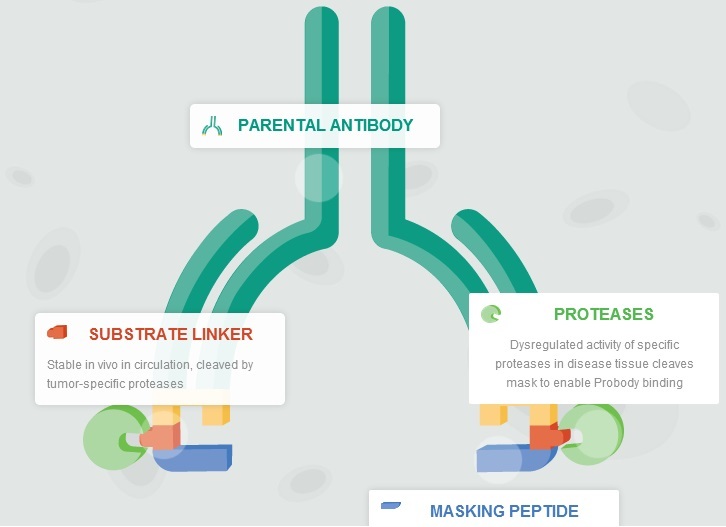 A masking peptide is fused to the light chain through a peptide linker that is cleavable by tumor-specific proteases. The masking peptide prevents the probody binding to healthy tissues, thereby minimizing toxic side effects. CytomX’s lead candidate is an anti-PDL1 probody called CX-072. The drug is expected to be better than other anti-PDL1 antibodies because the probody does not significantly inhibit the PDL1 pathway outside of the tumor. The company anticipates filing an IND in 2016H2. CytomX was named as a Fierce 15 biotech company by FierceBiotech in 2013. The company has filed Form S-1 for a $100 million IPO. Third Rock is the biggest investor, with 31% of the stock. Strategic partners include Bristol-Myers Squibb, Pfizer and ImmunoGen (NASDAQ: IMGN). Sci Transl Med. 2013, 5(207), 207ra144. The role of CD95 in cancer: promoter or suppressor? CANbridge Life Sciences, a Beijing-based biotech company, in-licensed China rights to Apogenix’s lead candidate, APG101. The drug is a fusion protein that consists of the extracellular domain of CD95 and the Fc domain of IgG1 and blocks the interaction between CD95 and its ligand. Apogenix has completed a Phase II trial in patients with recurrent glioblastoma. What interests me is the exact function of CD95 in cancer. CD95 (also known as Fas receptor) is a death receptor on the surface of cells that mediates apoptosis. Cancer cells often downregulate CD95 to evade apoptosis. Thus CD95 agonists were considered to kill cancer cells. However, severe liver toxicity was observed in mice due to CD95-mediated apoptosis of hepatocytes. In 2010, scientists from the University of Chicago speculated that CD95 could actually promote the growth of tumors. The discovery seems unbelievable because CD95 had previously been defined as a tumor suppressor. APG101 indeed showed a clinical benefit in patients with relapsed glioblastoma in the Phase II trial. PFS rates at 6 months were 20.7% for reirradiation + APG101 and 3.8% for reirradiation alone (p=0.048). Median PFS was 4.5 months vs. 2.5 months (p=0.0162). Median OS for both two arms were 11.5 months. In the Phase II trial, there was no difference in median OS. Many scientists still believe CD95 is a tumor suppressor[4,5]. Apogenix announced Phase II results in March 2012, but Phase III study hasn’t been initiated until now. The median OS of 11.5 months in second-line setting is not that attractive. Clin Cancer Res. 2014, 20(24), 6304-6313. Brain Pathol. 1998, 8(2), 285-293. J Immunol. 2012, 188(9), 4441-4449. J Biol Chem. 2012, 287(30), 25530-25540. Afferent Pharmaceuticals completed a $55m Series C financing. The round was led by Fidelity Management & Research Company, with participation from other crossover funds. The company was founded by the biotech foundry Third Rock Ventures in December 2009. Dr. Anthony Ford, the founder and chief scientific officer of Afferent, was previously a scientist at Roche Bioscience. About 15 years ago, Ford found that the ATP receptor P2X3 is critical for peripheral pain responses. P2X3 knock-out mice have reduced pain-related behavior in response to injection of ATP. Abbott Laboratories reported a non-nucleotide antagonist of P2X3 receptor called A-317491 in 2002. At that time Ford led the P2X3 discovery program at Roche. Afferent in-licensed the P2X3 program form Roche. Afferent is developing its lead candidate, AF-219, for the treatment of cough and bladder pain. Results from a proof-of-concept study in chronic cough patients have been published in The Lancet. The drug reduced cough frequency by 75% compared to placebo. Kathleen Glaub joined the company as CEO in August 2014. She was one of the Top 10 Women in Biotech in 2011 when her company Plexxikon was sold to Daiichi Sankyo in a $935 million deal. Plexxikon’s Zelboraf (vemurafenib) gained an FDA green light for treating melanoma that year. Proc Natl Acad Sci USA. 2002, 99(26), 17179-17184.